It’s your turn to carry the torch as we celebrate the Olympics! Will you be the one to bring back to your table a Gold, Silver or Bronze Metal? Our first event will be “Crop Hockey.” Be the first player to place your puck in your opponent’s net. 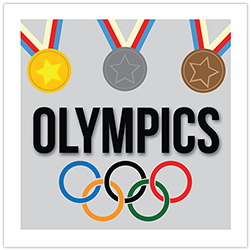 Next we will go to track and field where we will give new meaning to the term “Relay Race.” Show your Olympic spirit dressed in your favorite Olympic sports attire and you can carry the torch of a winner. Decorate your table space with as much spirit of the Olympics you can. Our final event of this night full of Olympic splendor will be a surprise event that you will not want to miss! Put on your running shoes, skis, skates, goggles, helmets, then grab your teammates for this night of Olympic memories.